Widespread demonstrations calling for governments to act against climate change entered a third consecutive day on Wednesday, with superglue-wielding protesters sticking themselves to key objects around the UK's capital. The Extinction Rebellion climate group, which organised the protests, said it wanted populations to take a step back and reflect on its climate actions. "Our aim is to create moments in time when humanity stops and fully considers the extent of the harm we have done and are doing to life on Earth," the group said in a statement. "It is vitally important at this time. It is a matter of life and death." 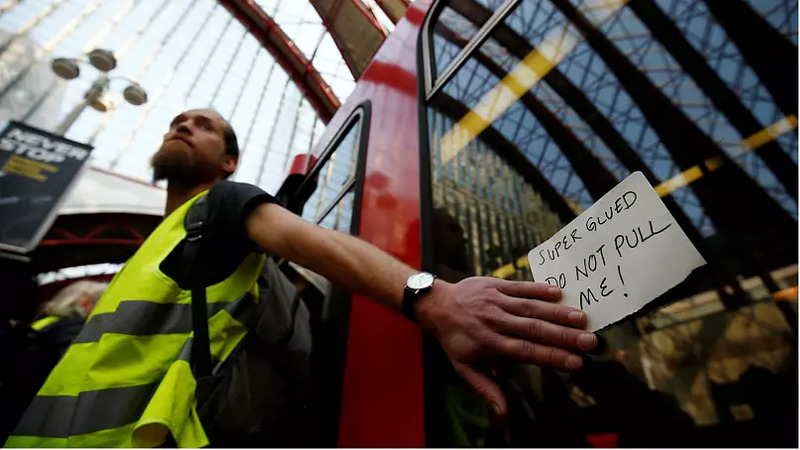 Travel disruption was initially reported on Wednesday morning at a busy commuter station in southeast London after two protesters climbed on to the roof of a train carriage, and a third protester on the platform below said he had superglued himself to the door. You can watch footage of the stunt in the video player, above. Meanwhile, another group of protesters said they had glued themselves to a fence outside the North London home of Labour Party leader Jeremy Corbyn. In central London, a protester that glued himself to Waterloo Bridge said there was "no where else in the world" he should be. "I'm using the fact that we have this privilege to peacefully protest and to be arrested respectfully by police, to stand up for our planet and future generations," he said. The protesters maintain that governments are not taking climate change seriously enough, and are demanding that a state of "climate and ecological emergency" be declared. 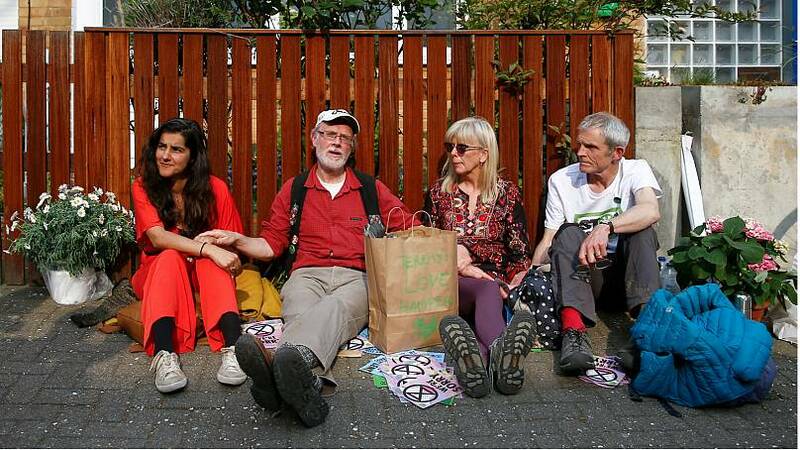 Read more: What are Extinction Rebellion's demands? In order to attract attention, the protesters are deliberately trying to get themselves arrested — more than 200 arrests have been made during the demonstrations in the last three days. 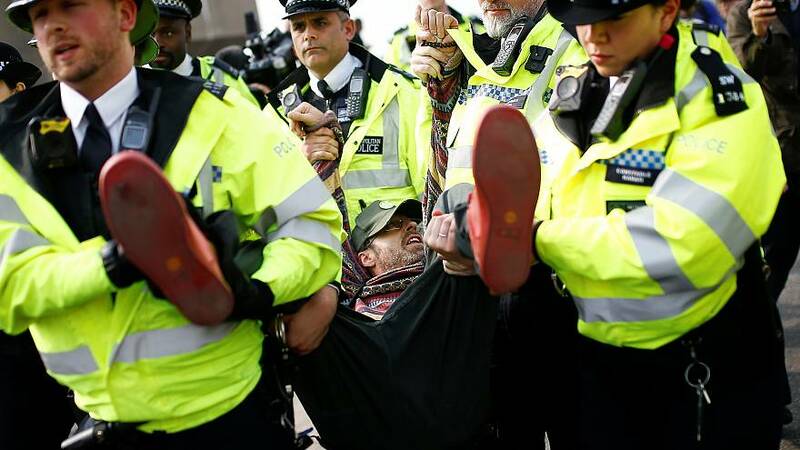 "Intentional arrests for criminal damage allow Extinction Rebellion to take this core strategy into the courts," the group said in a statement on Monday. "Trials that result from acts of criminal damage provide an opportunity to tell the courts that without an urgent and radical change of course, the consequences for humanity and life on Earth are likely to be catastrophic." 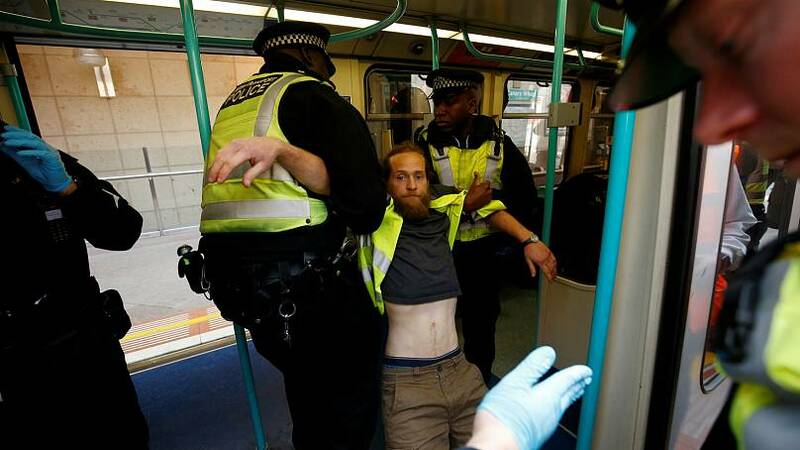 Extinction Rebellion activist Mark Ovland, who glued himself to the train door on Wednesday, told the group's livestream "we're doing what it takes". 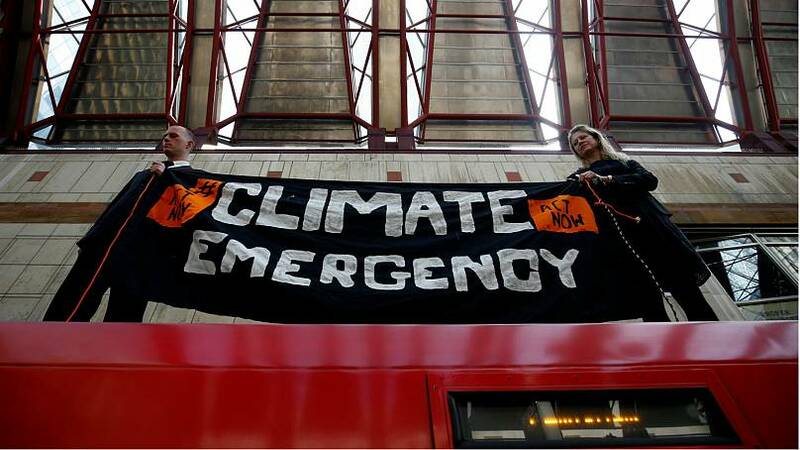 "Unfortunately it's going to take this kind of minor disruptance to get the government to act on the climate emergency," one protester on top of the carriage said. Ovland added: "We're non-violent. We're here because we don't want violence — to ourselves, to the world, to anything." Transport police were later pictured dragging the 35-year-old away from the platform, while officers also climbed onto the carriage roof to carry the other protesters down. This is the third consecutive day of protesting for the Extinction Rebellion group, which have showed few signs of slowing down. On Monday, the group protested in several of the UK capital's hotspots, including Oxford Street — London's busiest street — to demand action on climate change. Disruption was also reported outside the headquarters for Shell after protesters spray painted the building's facade and smashed the revolving glass entrance. Similar protests have also been held in other locations around Europe, including in Belgium, Denmark and the Netherlands.